​Our unbiased rowing machine reviews will help you find the best model for your needs and budget. There is a huge range of rowers available and you may find the choice a little confusing - I certainly do, and I've been monitoring the rower market for over eight years. First up.... don't panic! As they say, 'keep calm and carry on'. The model you choose really depends on a number of factors. The obvious one is how much you're prepared to spend. Then followed by your goals, the available room at home, the type of room you'll be using it. And lastly, how often and for how long you intend to train. I've taken all these things in to consideration when testing and writing these reviews to hopefully make the process of choosing and buying a rowing machine both easier, and perhaps even enjoyable. And once you have your rower, I have advice and example workouts to help you get the very best from it. Short of time? To save you the trouble of reading all my reviews within your chosen budget, here's a quick tip. 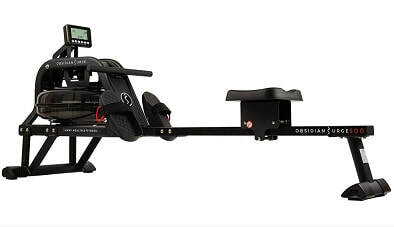 If you have a budget of around a $1,000 you really can't go far wrong buying one of the most popular rowing machines of all time - the Concept2 Model D. For $945 you'll get a rower that will last for years... and years ...and then a few more years. It has some great features. Gymnasiums, health resorts and rowing clubs all over the world love it, and so will you. If your budget is lower, or you have more to spend, don't be put off by the staggering choice of models out there. I can help you find the answers to all your questions, and ensure you get the best rowing machine that will get you into the shape of your life. There is a huge range of home fitness equipment to supply the huge demand, you can spend anything from around $100 to well over $2,500 - so you can imagine the difference in quality and reliability. However, buying the most expensive machine doesn't always guarantee you'll get a better model. There's no point buying a top of the range model, if you only plan on using it two or three times a week. Likewise, it's false economy to buy a budget machine if you intend to row everyday for an hour! It will let you down quicker than you think. For more help on making the right decision see our guide to buying a rower, and also check out our advice for buying a used model. Please note, we don't receive any payment to write our rowing machine reviews, we don't sell rowers, provide spare parts, and we don't promote any particular brand. We're only interested in finding good, reliable rowing machines and the best prices and deals on the web. This site is an affiliate of a number of retailers including Amazon and earn a small commission on sales. This does not influence the scores given to the rowing machine we review. The income earned through advertising and any commissions from retailers, is used to buy or hire models to test, and pay for reviewer's time. UK visitor? Check UK rowing machines here. To save you time, here's a summary of our best rowing machine reviews by price bracket. A budget machine in every sense with few features to get excited about. But in it's favor, it's quite a sturdy machine that should last longer than most machines for the cost. It's a magnetic rowing machine so it's quieter than an air rower, but you might find the seat starts to squeak after regular use. But despite it's negatives, it could still get your heart rate up and help get you fit. Note, if you intend to use your rower more than 3 times a week we recommend you don't buy a model in this price range. It would be unrealistic to expect a top rowing machine for under $250 but the Xterra ERG200 is not a bad rower for the low price tag. You buy fitness equipment for one reason: to get fit. So you need something that you can use at least four to five times a week for fifteen minutes or more to achieve that. So while this model doesn't have a huge number of features, it's quite sturdy and capable of dealing with some vigorous sessions to get you on your way to achieve your goals. To read my unbiased rowing machine review of the ERG200, please click the red button or the image. It's tough to get a mid-budget machine just right. It's not a real cheap machine so expectations are higher, but then it's not in the price bracket where you'd get a lot more. But Schwinn have got a pretty good effort here with the Crewmaster. It's heart rate enabled which is a big plus in this range. It also has a good monitor and is quite easy to use. Yes, it does have a few faults - it's not easy to fold, and it doesn't have any pre-set programs, but for the price it's well worth a look in our view. Click the button below the photo to read my review. One of the biggest surprises for us in 2018 was this water rower from Sunny Health an Fitness. It looks great, has the feel of a rower costing twice the price and is heart rate compatible. It has a solid, sturdy base and can take quite a bit of punishment, and due to the long beam is suitable for the taller user. And coming in at under $500 makes it well worth a look. To read our full review, click on the review button to the right. Absolutely no contest here. 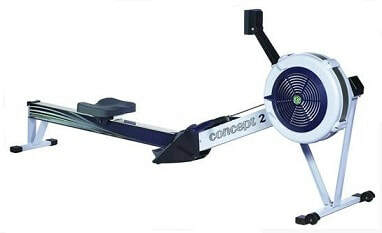 The Concept2 Model D is what the elite rowers choose over any other machine. Rowing clubs all over the world use this machine for indoor training and testing - because despite all the punishment of constant use, it will last for years! It's been around since 2003 so looks a little outdated when compared to the new boys on the block, but continues to get new features such as online functions and upgraded monitors. ​For the price it's still a steal. Also popular with gymnasiums and health clubs as it will take anything anyone can throw at it with minimum maintenance. Beautifully made from quality wood, the Apollo Pro is a joy to use. It comes with some great features including First Degree's adjustable resistance mechanism that cleverly changes resistance by a swivel of a switch - other fluid machines require you to add or remove water. The monitor comes with a USB connector giving you the chance to use online apps including racing against other users anywhere in the world. The price varies around the $1000 mark, but even if it's a little higher it's well worth the money in our opinion. 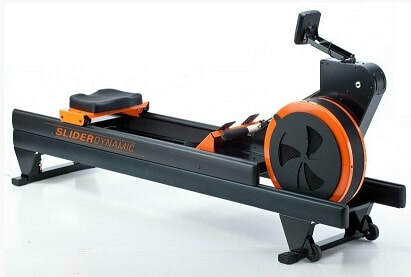 If you're wondering why it's got the name, 'Dynamic' just sit on it and pull back the handle - the whole rower moves beneath you while your seat stays in the same position. The action replicates the motion of a real boat on the water and it feels great! From the design, styling, and engineering to the feel of this machine - it's a winner. Great features, rock solid construction and even the simple things done extremely well. It adds a new dimension to training on a rower and once you've used it, you'll be reluctant to go back to the standard rowing machine. Also, great value for money, it's one of the finest rowing machines I've had to pleasure to review. Our reviews are written by people who have spent at least a week using the machine or already own one and have had it for over a month. We rate each machine using the following criteria. We've recently changed the quick reference info-graphic which appear on each review page. We rate the build quality, features on the rowing machine and value for money and then give it an overall score out of one hundred..
To read about the models we've tested to date, please see all our reviews, or use our comparison table to check the price verses features. We perform regular price checks, so we can recommend the best buys on the market. Our objective is to help you get the best model at a price you can afford. We also offer training tips on how to get the most from your rowing machine. For example, one of the best ways to get great results from your workouts are heart rate training programs and we recommend this great workout program with over 20 workouts. Choosing the right model for your needs and budget could make a huge difference to you health and well-being. We hope we can help you make it with this website. Hi, I'm Roy Palmer and I love to row. I coordinate this website and test rowing machines and also use a number of rowers around the world to tell me what they think of their machines. I'm also an athletics coach and teacher of The Alexander Technique with over 30 years experience in competitive sport and coaching. If you can't see a rowing machine you'd like us to review, please let me know. Fitbill claim their F.Row is the smartest rowing machine on the market, but at $169 can it be true? See our review here. So what do we think of ERG500 from XTERRA? Should you go for Concept2's Model D or Model E - check our guide here. Found this fascinating website about the history of rowing. "My best to you Roy and again thank you for taking the time to do your rowing machine reviews. They were a big help to me." Skip Davis, San Diego.